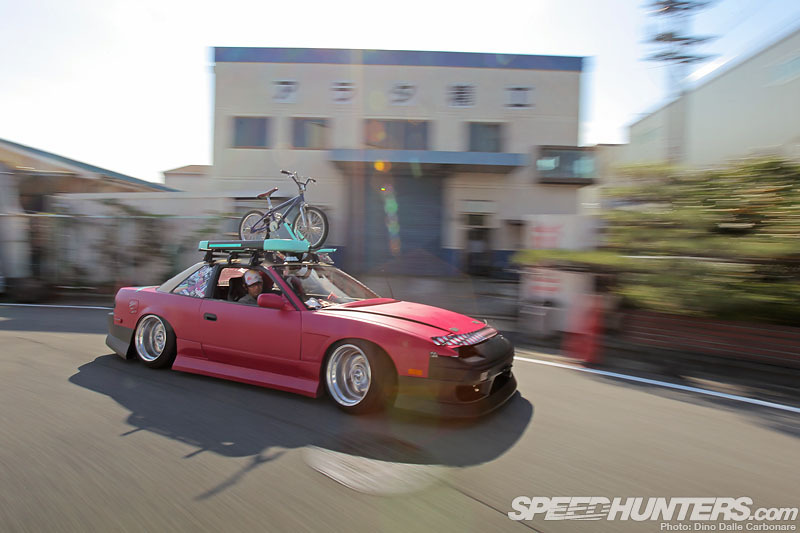 … an interim of a path the whole drift, stance, JDM and USDM movement is currently going down in Japan. This country has always been the trendsetter in a lot of ways, but this recent influx of US style has turned things upside down a little right now. This however in no way implies that the Japanese have began to copy, but rather approach the whole newfound popularity of these trends in a very individualistic manner. Japan has always done so, ever since it opened its shores to strange and wonderful foreign lands, sending experts and engineers around the world to learn the way of the West, bringing back their newfound knowledge and applying it, improving it and evolving it in a way that only they know how. That’s precisely what Masayoshi Nagano’s Onevia represents here. The car is still a very much functioning drift car, yet ticks all the right boxes of must-have detailing that differentiates this very new way of doing things. 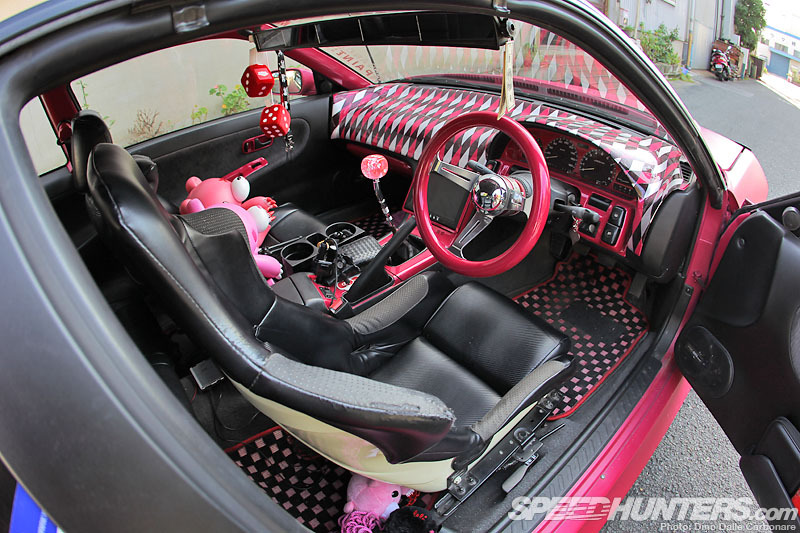 So while you attempt to make sense of all these observations, let’s take a look at the car itself. 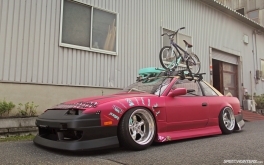 The grafted-on 180SX face is what makes the base S13 Silvia an Onevia, running a Rose Bud RPS13’s flip-up light face kit – modified to function in a fixed position. The car sports a Julius full aero kit, comprising of front and rear bumpers as well as chunky flared-out side skirts. An Origin FRP Type 2 hood replaces the stock steel piece and is held in place with a pair of Aerocatch latches for extra safety. 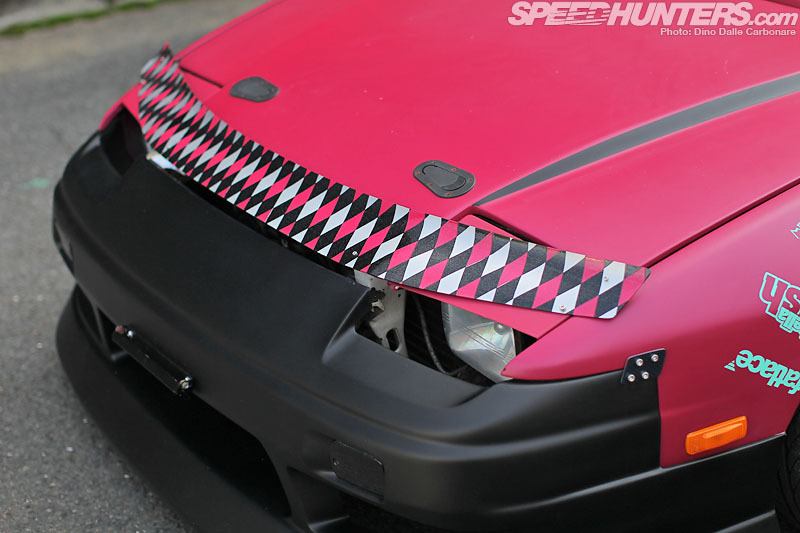 The first USDM touch is the checkered bug deflector, custom made and painted by Nagano-san and screwed down onto the hood. Spicing up the profile of the car are the ings front aero fenders, which are actually a lot wider than the stock items, perfect to contain the Work Goocars Hemi wheels. The 17-inch rims measure 9J across the fronts and 10J across the rears and are shod in ATR Sports tires, 215/40-section fore and 235/40-section aft. They run pretty aggressive negative offset to obtain the desired deep rim look that Nagano-san obviously loves. The car sits on D-Max D1 Spec adjustable suspension that has been set at a pretty low height for both looks and performance. 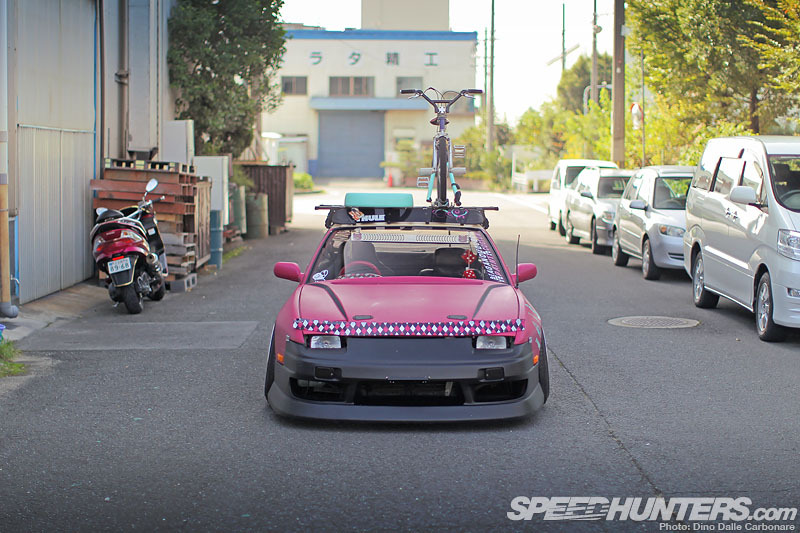 As I stated above, this is a fully functioning and properly set up drift car and absolutely nothing has been sacrificed for looks. 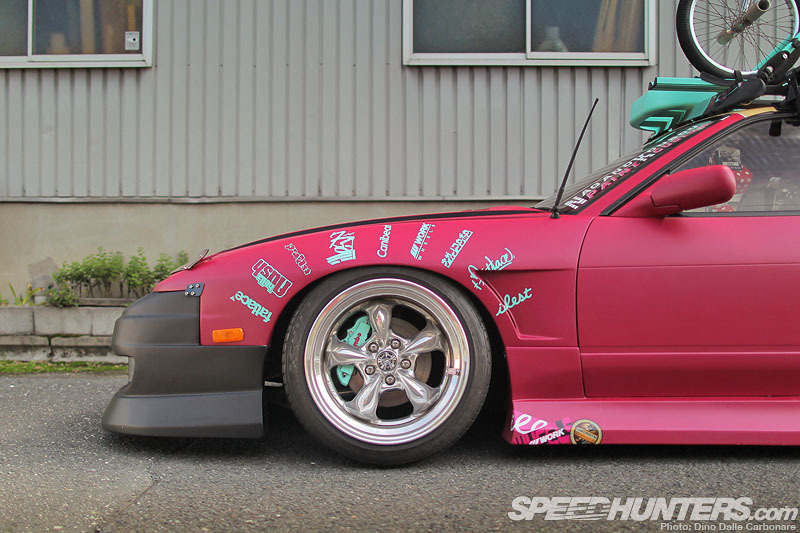 Underneath, a Nagano Koubou short knuckle kit makes sure there is plenty of additional steering lock to play with, while a drift-oriented geometry can be run thanks to the fully upgraded front and rear links. D-Max tie rods, tension and traction rods and toe arms join adjustable D-Max upper arms as well as Ikeya Formula lower arms. Thicker sway bars keep roll to a minimum while the upgraded AP brake pads offer better and stronger pedal feel. The Brembo calipers you probably noticed two pictures up, are actually plastic covers. 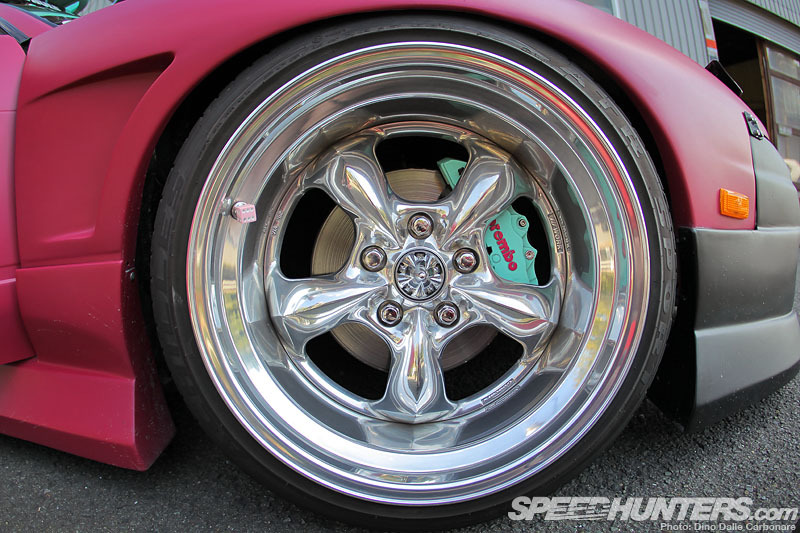 Nagano-san blistered and rolled the rear fenders to accommodate the deep offset of the wheels, allowing the car to sit very appropriately, be it for a drift as well as a stance-oriented ride. Color was used to not only highlight the unique project itself but to show what Nagano-san is capable of. 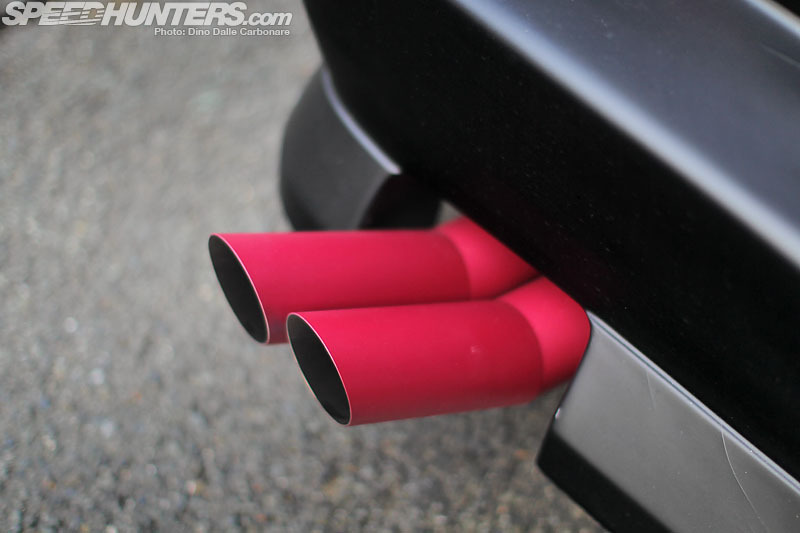 So against the custom matte pink body paint a contrasting flat black was chosen for the bumper while the roof received a few coats of non-glossy sand brown. 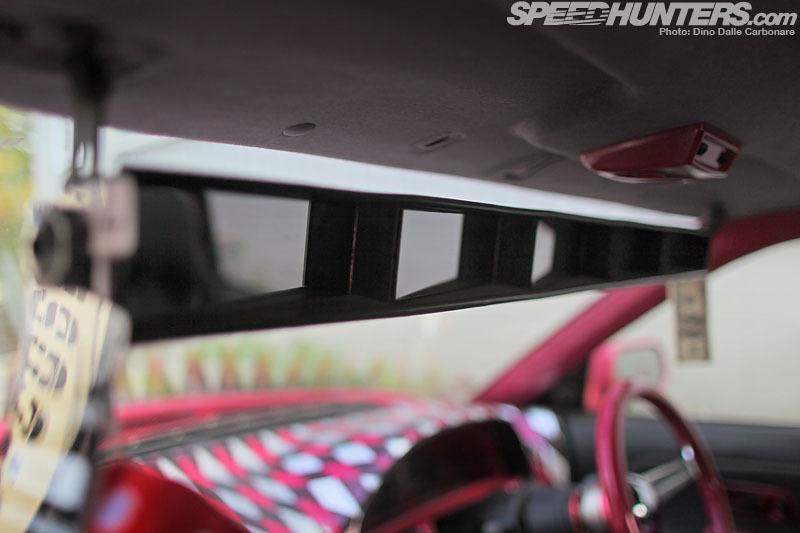 Color coordination is taken pretty seriously all over the car, and from the rear one of the things you will instantly notice are these pink louvers! … wherever you find the space. 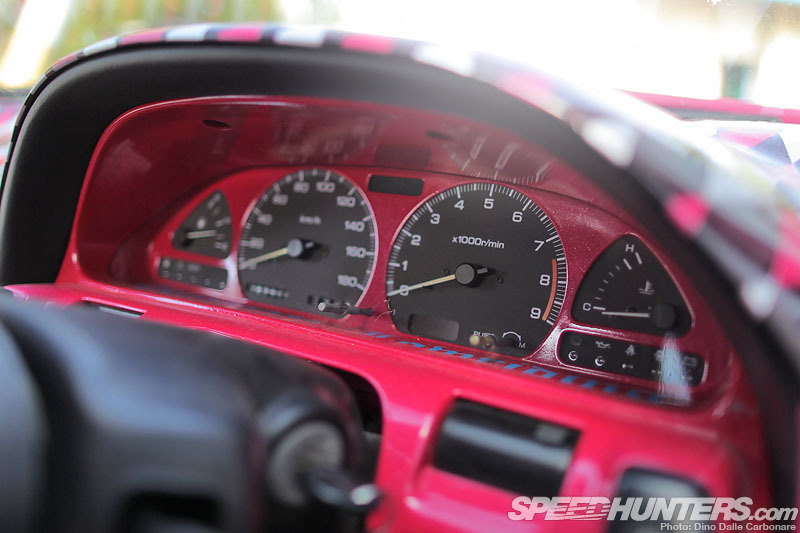 We appreciate the positioning of the Speedhunters logo! 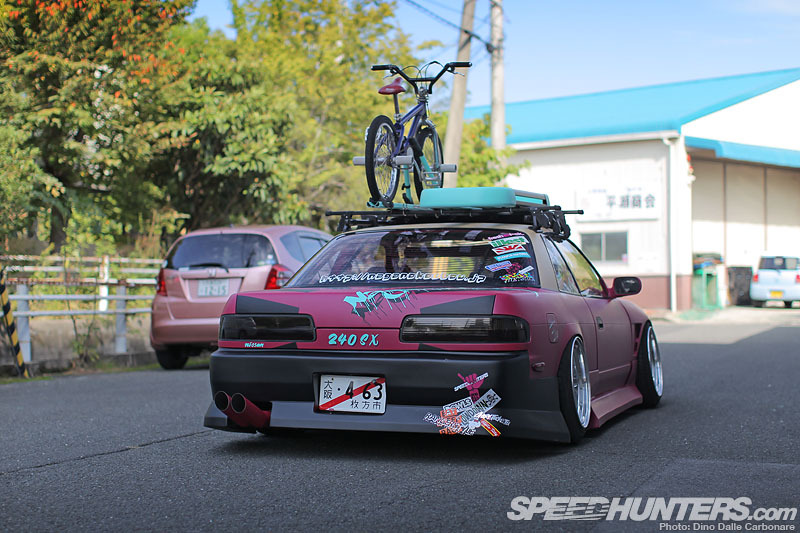 It’s touches like the takeyari exhausts that make these “USDM meets JDM” cars so unique. The obliquely cut tail pipes – a detail borrowed from Kaido Racers and inspired from old Japanese bamboo spears – are a very boso sort of element and one that stands out thanks to its color-matched hue! 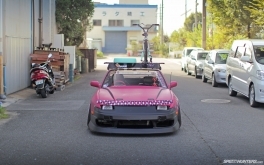 The concept that Nagano-san wanted to go for was a Hawaiian sort of feel, loving what the guys in those far and warm Pacific Islands are doing with their rides. 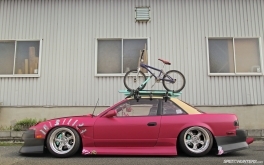 He opted to fit the popular roof rack some like to run in the scene, and on top added a cycle rack which holds his BMX safely in place. Guess the bike comes in handy at the track! Under the bonnet the S13 has received a whole new heart, an SR20DE swapped over from an Autech S15 Silvia. The motor has remained stock but is fitted with a set of stainless steel headers and the exhaust we have already seen, custom made by Nagano-san and pretty much as straight and as big bore as it can get. 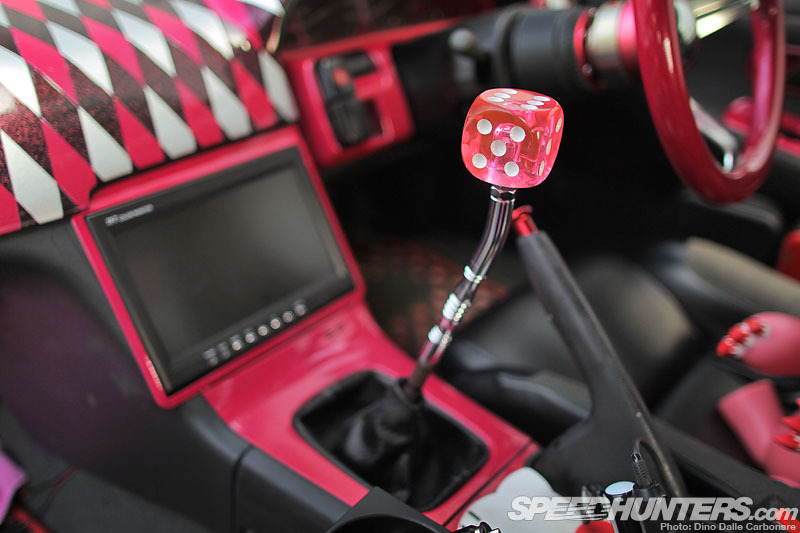 … not to mention the dice-top extended shift lever. Is it just me or does there also seem to be an underlying dice theme going on here? All must-have JDM-gadgets are present like the big LCD screen displaying the maps from the HDD navi unit. Here is another impossibly Japanese detail, the Dekotora truck rearview mirror. This monster spans right across the top of the cabin and offers a panoramic view of your rear surroundings. 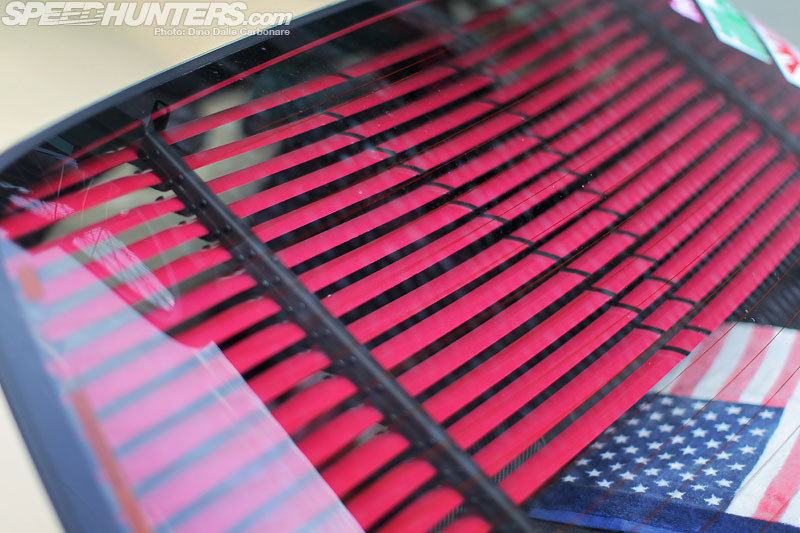 All plastic trim in the cabin has gotten the pink treatment and the dashboard is protected in a FRP molded covering that has been painted in the same checkered pattern as the front bug deflector. Julius full aero package, ings front wider aero fenders, Origin Type 2 hood, Rose Bud face headlight kit, flared and rolled rear fenders, Origin smoked taillights, Thule roof carrier with cycle rack, Thule fairing, Nagano Koubou original matter pink paint, Nagano Koubou original brown paint for roof section, Nagano Koubou original bug guard, Mooneyes rubber antenna, Nagano Koubou custom rear lettering. I think it's a little ridiculous that people are sitting here and can't even say anything nice about the car. 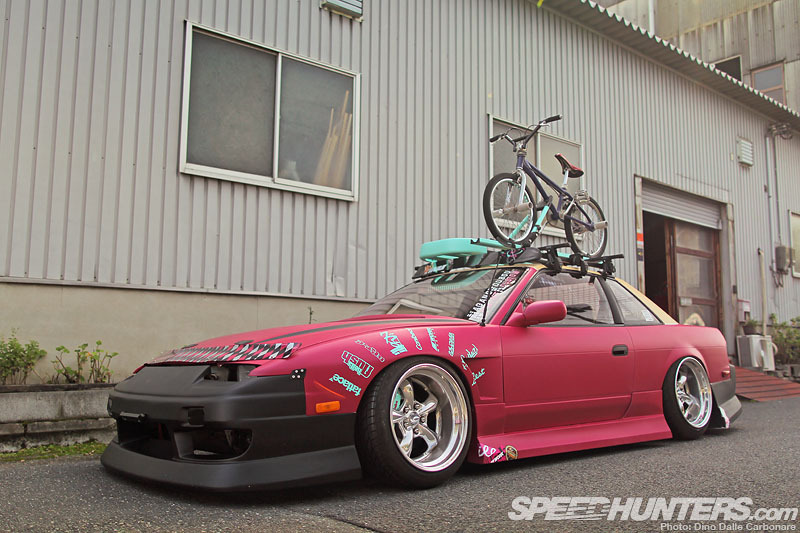 It's JDM Purist this and JDM Purist that. 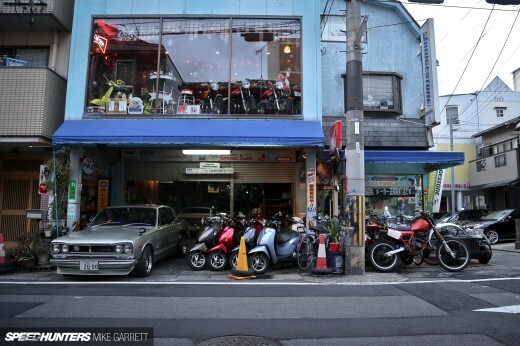 In Japan they take their own spin at what we do to our cars (in the states.) and do it even crazier. The Brembo caps were more than likely a joke or something. 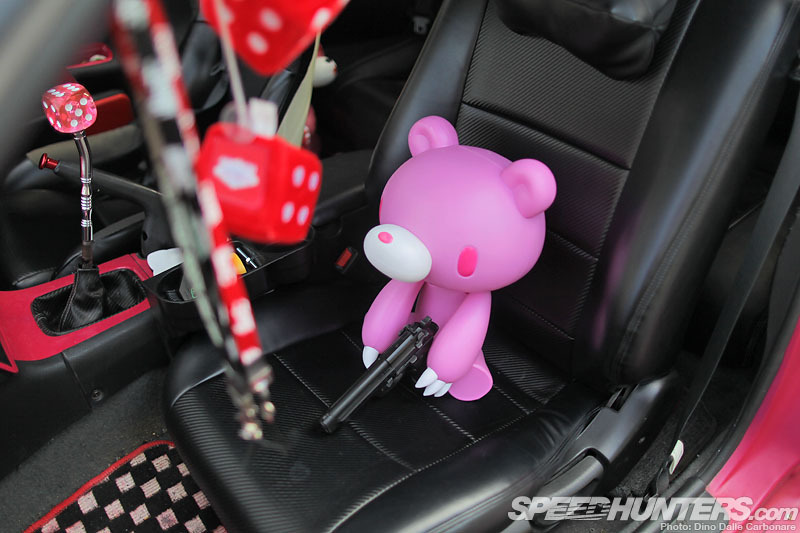 Let's not act like it plays a dysfunction in the vehicle, as it does absolutely nothing to it's driving ability. It functions better than almost anything most you guys could come up with. Give it up, seriously. Quit being wannabe purist, quit hating. I bet half of you thought the wheels were Torq Thrust. 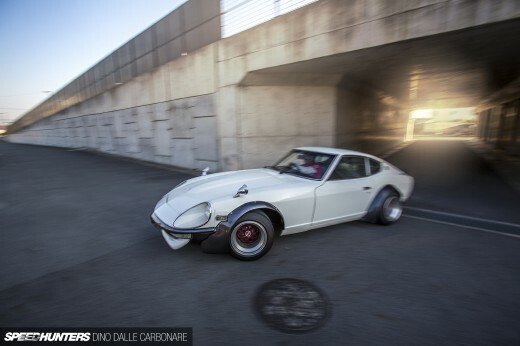 Who cares if it's not the traditional Japanese car.